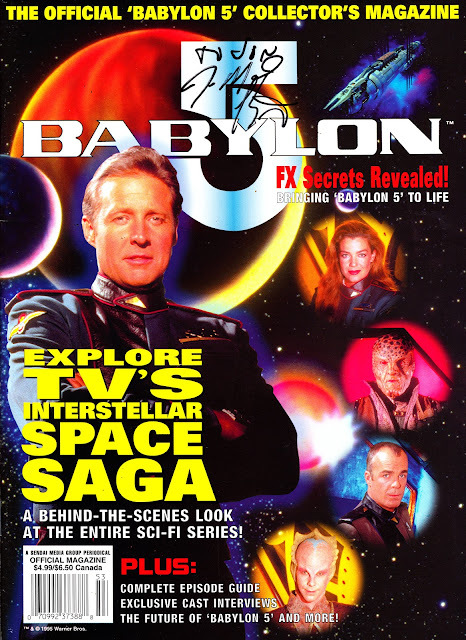 This is THE OFFICIAL BABYLON FIVE COLLECTOR'S EDITION MAGAZINE, a US one-shot published by Sendai Media back in 1995. It was the first official magazine devoted to the show and pre-dates the regular (and - frankly - superior) mag from the UK's Titan Magazines which ran 1997-2000. It probably appeared somewhere between season's two and three, possibly coinciding with the third-season launch. This is the harder-to-come-by-in-the-UK American edition. Imports were limited because Titan picked-up the reprint rights and issued a British edition with a new (and - if memory serves - distinctly underwhelming alternative cover). As you'll see, I got this signed at the time. I'm not 100% certain but *I think* this is the signature of JMS himself (it's certainly someone associated with the show) from a signing at London's FORBIDDEN PLANET store (when they were still ensconced in New Oxford Street). The show, which aired on Channel Four, was (relatively speaking) a big deal at the time in the UK and it seemed like members of the cast (and JMS himself) were frequently commuting back-and-forth across the Atlantic for conventions, signings and personal appearances. Sendai were also responsible for CINESCAPE MAGAZINE.